Hitch a ride with Dogs on the Farm and Cats Too! The Tails A Wagon little red school bus makes sending your pet to the farm even easier! The bus is available for doggie daycare, dog/cat boarding, and grooming clients. We will come right to your door to pick up your pet, or schedule an early morning pick up for your dog at your bus stop, ferry dock, or train station. We offer safe and reliable transportation in an extra large travel crate or seat belt harness. Price varies by location. Please call for a quote for your location. The Tails A Wagon bus has another important job: delivering donated pet food to local food banks and pet shelters. Please call if you have food you would like to donate. Hey city dogs and cats! Come get a taste of country living while your family is on vacation. 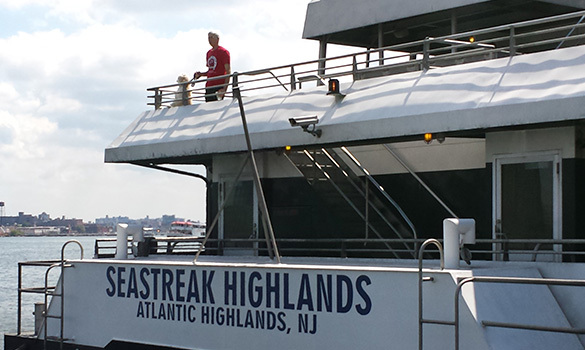 We will pick up dogs and cats on the Seastreak Ferry and deliver them to the farm. We will also return them to a designated ferry drop-off at scheduled times.